From February until the beginning of June every year, I spend my time thinking about and working on the next year’s calendar. I am always very proud of the calendar and think it is one of the best calendars available but you might be surprised that I do not use it in my office for my wall calendar. The reason is simple: the reproductions, no matter how good, are not as good as the originals. Because we work with an excellent printer, the reproduction approaches best possible with four-color offset printing. However, if I had the calendar on my wall, I would be constantly annoyed by the fact that the prints are not as good as the original oil paintings. This brings me to my point. Many of you have gotten and enjoyed the calendar for a number of years now, but don’t have an original painting on your wall. If you enjoy the calendar, I can guarantee that you will enjoy a painting even more. There are variations in color and details and that cannot be replicated by a printing press. I carefully select all of the paintings on the website, working with only the finest Maya artists, ones who I feel have some exceptional quality about their work. There are paintings by Elva Vasquez on the website for $25, the price of two calendars. I have picked Elva’s paintings, for instance, because they are delightful. Her painting will give joy to anyone who owns one. A small, original oil painting is available on the site for $50 to $100. A museum quality oil painting by Pedro Rafael Gonzalez Chavajay goes for $100 to $300. Each painting is like a window opening on the world, giving a unique view that no one else has. I have to come to enjoy the small paintings because getting more paintings into the same space is like having more windows. Even with the downturn in the world economy, Casa Rosario Spanish School seems to be thriving. Quite a number of families are coming to San Pedro to study Spanish and at the same time enjoy a vacation. Guatemala is the best place in the world to learn Spanish. You get quality private instruction: each teacher teaches only one student. San Pedro is the least expensive place in Guatemala to learn because the cost of living is less in San Pedro than in Antigua or Quetzaltenango. San Pedro also is on the most beautiful lake in the world, Lake Atitlan. There are at least fourteen Spanish language schools in San Pedro. Casa Rosario and Corazon Maya, in my opinion, are the two best for serious students. Casa Rosario is the oldest school, and for families with children probably the best because the two directors, Vicente and Samuel, go out of their way to tailor and make the experience wonderful for each child. Casa Rosario also has the most beautiful lake-side garden (this photo was taken from part of the garden) of any of the schools in San Pedro. 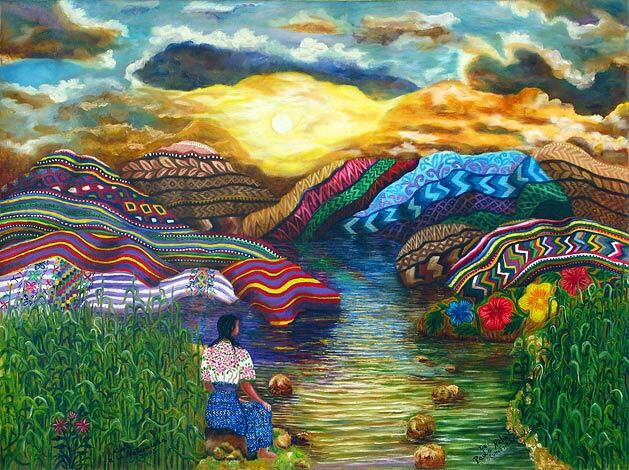 A new addition to our site is the watercolor paintings by Tz’utuhil artists Chema Cox and Edwin Gonzalez. Chema Cox started out painting in oil colors. 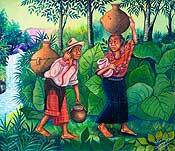 He began to lose interest in the Tz’utuhil Maya style of painting when he encountered the painters of Antigua Guatemala whose watercolors are in a more traditional, photorealistic style. His colors became softer and he soon switched to watercolors. At first the results were (at least to me) disappointing. He began to teach young his nephew, Edwin Gonzalez the technique. Edwin showed amazing ability and within a couple of years both of their paintings reached a point where their work could no longer be dismissed. The intricate detail of their paintings is nothing less than astounding. 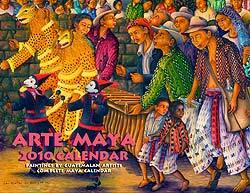 They specialize in depicting the Maya people in the landscape, and disappearing Maya customs. Chema, who for many years was a grade school teacher and has three daughters, is especially fond of themes of children playing or interacting with adults. Because often both Chema and Edwin work on the same painting, they will under Chema Cox’s name and section on the website. Until July 15th Arte Maya Tz’utuhil is offering paintings by Mario Gonzalez Chavajay, Diego Isaias Hernandez Mendez, and Jose Antonio Gonzalez Escobar at 20% off. I have new works by each of these artists, but before I post their new paintings I want to reduce my stock of paintings I have on hand for each of these artists. Mario, for example, painted 40 paintings this year. I deposit money in Mario’s bank account every month whether or not I sell any of his paintings. This covers all his living expenses and the costs of his children’s schooling. This sale is an opportunity for you to get paintings by these artists at a reduced price, while helping me continue to fulfill my financial commitments to these artists. 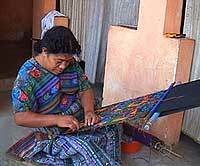 Kathleen Vitale of Endangered Threads Documentaries has put out her third video: Manuela & Esperanza: The Art of Maya Weaving. Her second video, A Century of Color: Maya Weaving & Textiles, was the best cinema graphic overview of Maya weaving yet made. This video goes into further detail. Two accomplished Maya weavers, Manuela Canil Ren of Chichicastenango and Esperanza Pérez of San Antonio Aguas Calientes (pictured left), weave traditional blouses (huipiles) in less than three months. The weavings done in San Antonio Aguascalientes use among the most difficult weaving techniques, the double sided brochade. Most Maya families in the Lake Atitlan region of Guatemala are dependent on coffee for most of their cash income every year. It takes about seven years of raising a coffee plant to get to the point where it will begin to fruit. The coffee plants require regular care, and during December and January when the ripe coffee is harvested, the workers get up at dawn to pick the berries. Sacks weighing more than 100 pounds are carried on their backs up and down the mountain paths until they reach a buying station that is often many miles from the fields. 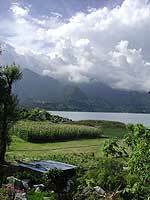 The Lake Atitlan coffee, which is among the best in the world, sells for $6 or more a pound in the US, but the people who grew and picked the coffee often get only 10 to 15 cents a pound. Many years they do not make as much as it cost them to produce the coffee. It is important, whenever possible, that we in first world nations try to buy only Fair Trade Coffee. 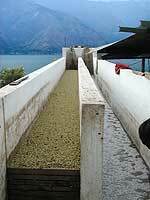 The photo at right shows the coffee beans being washed. Afterwards they will be dried in the sun, and then bagged for export. In a project called Art Across the Americas, Arte a Traves las Americas, Twelve students from Bloomington’s elementary, middle and high schools traveled on a cultural exchange trip to a small town in Guatemala. This Mayan community, San Juan la Laguna, is surrounded by a rich artistic heritage and a flourishing Mayan culture. The students designed and painted a mural (left) with their Guatemalan peers for two weeks in June of 2008. In the summer of 2009, students from San Juan will come to Bloomington to complete the cross-cultural exchange. Mayan students will be introduced to life in the US and will collaborate to design and paint a mural with their Bloomington peers. San Juan la Laguna artists Antonio Vasquez Yojcom and Antonio Coche Mendoza helped in the design of the mural. San Pedro la Laguna artist Pedro Rafael Gonzalez Chavajay, who has taught art classes in the public schools in San Juan la Laguna for many years, will be one of the adults accompanying the children on their trip.